Killer whales (Orcinus orcas) are massive cetaceans that reside all over the planet. They are the biggest dolphins in existence and are fierce carnivorous predators, with diets that are made up of varied components such as seabirds, squid, fish, sea lions, seals, octopuses, sea turtles and sharks. Killer whales are often referred to simply as orcas. As far as size goes, killer whale females are capable of weighing a maximum of 16,500 pounds, and the males, 22,000 pounds. 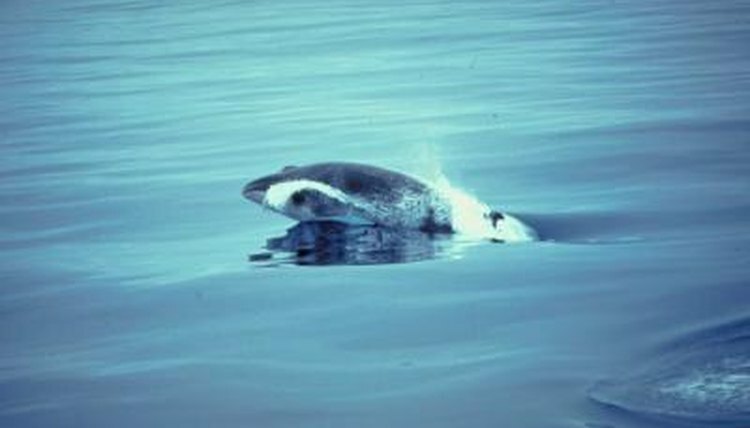 The females have smaller dorsal fins and flippers than the males do, too. Killer whales' body coloring is a combination of gray, white and black, although they are predominantly black. Their social units are known as pods, and they are usually made up of 10 individuals or less. In rarer instances, killer whales live in pods of a few hundred specimens. They partake in hunting activities with their pods. If a marine setting exists, there's a strong chance of killer whale residency. They inhabit every single ocean, which includes everything from the Indian Ocean to the Arctic Ocean. Although they are abundant essentially everywhere on Earth, they are slightly less prevalent at lower latitudes. Killer whales also frequently live in bodies of water that are somewhat shut off and hard to access -- think the Red Sea, the Gulf of California and the Mediterranean Sea, for example. Within their ocean haunting grounds, killer whales typically gravitate to waters with depths of between 65 and 196 feet. When on quests for sustenance, however, it isn't rare for them to venture nearer to the coast in waters that are much shallower. Killer whales also favor cold waters, although they frequently remain in temperate locations, too. Less commonly, they can also be found in both subtropical and tropical environments. Bizarrely enough, some killer whales even make appearances in freshwater rivers, such as the Rhine of central Europe. Killer whales can be seasoned travelers within their ocean habitats. Certain members of the species have been observed traveling from the middle portion of California all the way up to Alaska -- which makes up over 1,242 miles. Disruption of their natural habitat is a problem to some communities of killer whales, notes the IUCN Red List of Threatened Species. Habitat issues are especially worrying in areas with whale watching activities -- and plenty of traveling boats. Not only can these boats lead to potential harmful injury in killer whales, they can be sources of stress for the big guys, causing members of the species to go far out of their way to dodge encounters.